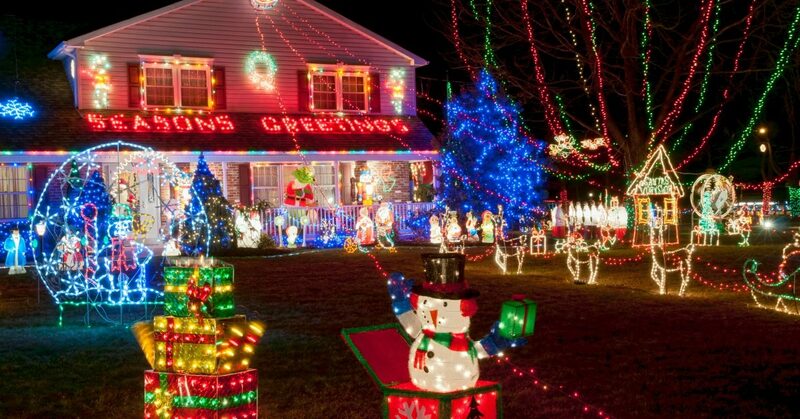 Are you your neighborhood’s Clark Griswold? Do you save up money especially for December’s electricity bill? Whether you are or not, the team at Tim Leeper Roofing wants to ensure your holiday spirit doesn’t cost you later in the year. Holidays are some of the most abusive times for roofs, because people climb all over them, nail inflatables into them, and staple strings of lights onto them. The good news is, there are ways for holiday decorations to surpass everyone’s expectations while leaving your roof ready to handle the rest of winter. Read on for some special decorating tips! When you puncture a shingle, you undermine its ability to shed water and stand up to the elements. It doesn’t matter how small the puncture is; a hole is a hole, and holes should never mix with roofs. Instead, invest in plastic clips. These are easy to install and will keep your lights in place along the eaves without compromising your roof or your gutters. It’s hard to make inflatables or figurines stay up on the roof when the wind picks up. Don’t fall into the nail or staple trap. Instead, use twine or rope to secure decor to your chimney. Check to make sure you aren’t creating a fire hazard. If decorations don’t stay on your roof, don’t fret. Simply put them in your yard. Everyone will be able to enjoy them – including you! If your roof has trouble this holiday, let us give you the gift of excellent handiwork. Turn to Tim Leeper Roofing for customized, caring roofing services!